For reasons that I can not fully understand, some people believe that if I have accumulated $100 dollars someone else somewhere else has lost $100. To make the story worse, if I’ve accumulated $1,000,000 then a lot of people have lost money so that I could get it. This is simply not true! If you believe this and are afraid, ashamed or embarrassed to learn how to become wealthy because of it, please read on and comment at the end. In America, and throughout the world, the way money is created is a rather complex process that, after reading and studying for hours, I still have yet to fully comprehend. But that’s not at all important right now. You just need to understand a few key concepts and examples about money and it will become clear to you that not only is the money supply not fixed, it’s ever increasing and that’s a good thing. Money has been around for several thousand years. If you read the Bible, Jesus references various coins including a denarius when he declares, “Give to Caesar what is Caesars.” Between 300-400 AD it’s estimated that 55 million people lived in the Roman empire. Our population is now approaching 7 billion. If each person 1700 years ago had $1000 than the entire wealth in the world was $55 billion. Out of almost 7 billion people today, the 2 richest have amassed more wealth than that and at one point, with the economy booming, the richest man in the world was worth nearly $50 billion alone. So what does this tell us? Money is a byproduct of economic activity and increases because of it. In other words, if everyone has a job, everyone has money and somehow the banks and governments figure out how to keep printing money to keep up with it. Again, how they do that is complex and secondary to this discussion. Just grasp that there’s more money today than before and at the same time our standard of living is higher (though not everywhere as unfortunately not everyone is taught this lesson). 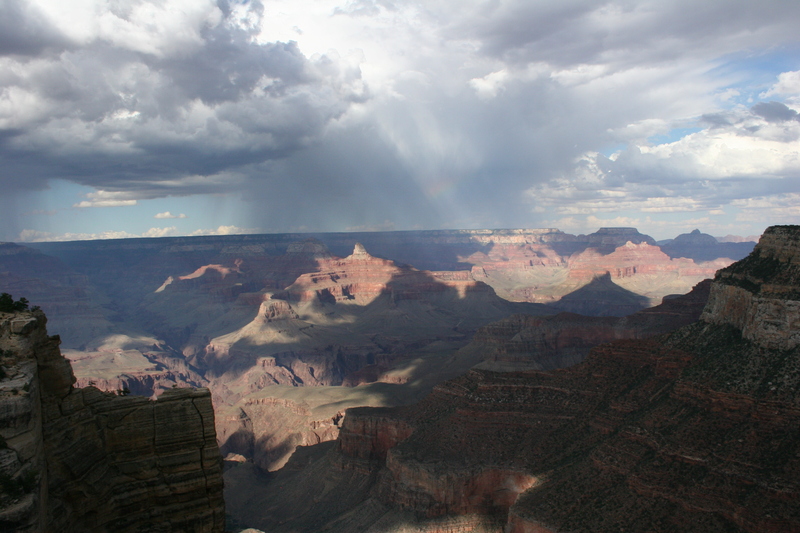 Creating economic activity by contemplating my book as I enjoy a distant rain storm at the Grand Canyon. Money does grow on trees and can be dug out of the ground and can be created on a computer. Think about it. What does it cost to buy a 2×4 at the local hardware store? What does it cost to buy a tree that you can then cut down, process and make a 2×4? If you look at the cost of the raw wood while it’s still in the tree, it’s pretty cheap, maybe worth a few pennies. If you then figure out what the treated 2×4 costs after it’s been cut, cleaned, shipped, and displayed at your local lumber yard it’s still pretty cheap. Maybe $5 for that piece of wood. Now take the cost of a completed frame of a house and divide that by the number of 2×4’s and you’re looking at closer to $20-$40 per 2×4 depending on location, complexity, labor costs, local taxes etc. So why the constant increase in cost? Because more economic activity is being added at each level. And guess what? The whole time those are being processed and houses are being built, new trees are being planted and grown to sell all over again. Now consider all of the resources all over the world from our food supplies that are being farmed and grown every year, to new oil reserves that are being found because of new technology, to drinking water that’s constantly being recycled, and you realize quite literally money does grow on trees and so can never be a fixed amount. Now consider that sitting in front of a computer using virtually no resources I can create a software program that has value even though the raw cost of goods is nothing more than my own energy or, in other words, the only cost is my own economic activity. Sitting here with my computer I created value out of nearly thin air. To take our tree analogy further, what is the cost of that wood when it’s converted into paper and a book is published on it? The added value for the book was partially due to refining and colors and other raw goods and the rest was created out of thin air or more precisely out of someone’s mind. That being said, in my opinion books are by far the greatest value in the world since you can learn from a person’s lifetime of experiences and lessons for $15 or less. It’s the Federal Reserve’s and International banks’ job to keep the supply of money on par with the economic activity of the world. Whether you agree with their policies is irrelevant. I’m just pointing out that, that’s currently the system we have in place. They print money and provide money to the member banks and attempt to keep inflation in check throughout that process. And they print more money every year because more economic activity is added to our economies every year. To finally tie all of this together, if you figure out a way to extract oil out of the ground more efficiently and I concurrently figure out a way to cut and process trees into lumber more cheaply we both have added value to the economy at the same time and neither of us stole money from anyone else to do it. This happens every day. Again, just consider technology companies and authors who create value out of thin air and it should be obvious to you that the only thing they stole from anyone else was their own time and thought. In conclusion, there’s enough wealth and abundance quite literally for everyone, not just in the US, but in the world. Rich people don’t make poor people by making more money and poor people aren’t poor because there are too many rich people. As I pointed out above, that’s just not how money works. So don’t feel jealous or greedy because you want to provide a comfortable lifestyle for you or your family. More importantly, be sure to help as many people along the way achieve that same level of success. Hey Bryan, sorry to break it for you, but your $100 does come from somebody else. There is a fixed amount of money in the system at any given time, so your income is somebody else’s expense. It’s as simple as that. That said, wealth is not taken, it is given. It’s always the customer who decides who he’s going to give his money to. If you come up with a great product, less business will be going to your competitors. As for the cause of poverty, to me it’s obvious that the cause is not the rich, but the gap in spending power between you and your typical co-citizen. If everyone around you has more spending power than you have, they will outbid you for those scarce resources. Remember the food riots in Africa and other countries in the Summer of 2008? Those were the people that couldn’t keep up with their peers in other developing nations whose earning power was rising faster (e.g. China). So Bryan is right in saying that it’s not the rich who cause poverty. That would require a level of wealth concentration that is nowhere nearby. As always, thanks for the input! You are correct, at any given instant, there is a fixed amount of money and the $100 I get is from someone else. However, money in the system increases over time “in theory” to match economic output. I say “in theory” because if it was done perfectly there would never be any inflation or deflation. Without getting too political in a business blog, the only reason there can be an ongoing gap between the wealthy and poor is if the poor don’t have the freedom to better themselves, in particular, through being able to buy or start a business. My blog teaches ways to evaluate, negotiate, and acquire a small business for little money down so you can grow it, sell it and repeat the process. As for the food riots, there were a lot of reasons for those increases in prices but, as you pointed out, it wasn’t because of the rich stealing money. Thanks again and good luck with your entrepreneurial endeavors! Conocojones, Here’s a blog by Perry Marshall that explains my point about Africa and the necessity of entrepreneurs with a real life example. Bryan, thanks for the link. Despite my remarks about your argumentation, we’re on the same page about entrepreneurship. Entrepreneurship is the most creative and noble thing out there. It may be motivated by greed in some cases, not always self-expression, but doesn’t the same hold true for employees? Taking individual character out of the equation, it should be clear to anyone that entrepreneurship is at least as worthy as being an employee.